Entering Pandora: The World of Avatar is a multi-sensory experience. The first thing you’ll notice when crossing the bridge into the Valley of Mo’ara are the noises. Animals, that seem to be just out of sight, sound a little dangerous. Pressing on into the jungle, colorful and unfamiliar plants catch your eye until you turn a corner and there, hovering far above the landscape, is a floating mountain range, with the mist from a 130-foot tall waterfall carried on the breeze. If you have been patiently waiting for the chance to experience this otherworldly experience yourself, you are in luck. The brand-new, 12-acre Pandora: The World of Avatar opened to the public at Disney’s Animal Kingdom on Saturday, May 27. Six years in the making, Pandora is based on James Cameron’s top-grossing film Avatar, and allows visitors to travel 4.4 light years to the distant planet in the Alpha Centauri star system. If none of this makes sense to you, don’t worry. While general knowledge of the 2009 film will enhance your experience, it is by no means a prerequisite for enjoying the land. Avatar Flight of Passage, where you soar high over Pandora on the back of a mountain banshee, is the clear star of the show in Pandora, even more so than the imposing mountain range. The ride’s technical aspects are on a whole new level, combining the flying theater of Epcot’s Soarin’ with the motion simulation of Star Tours, but on personal jet ski-type ride vehicles. Though you can’t possibly be moving very far, you truly feel like you are flying, with the wind in your face and smells of Pandora surrounding you. The ride’s queue is long (it is estimated to hold a five- to six-hour line), but could be considered a walk-through attraction of its own. Venture from the Valley of Mo’ara and deep into a cave where you can explore the research facility that has made it possible to link with an Avatar and take flight. If you’re visiting the park any time soon, you’ll definitely want to book a FastPass+ for this ride, but know that in bypassing the standby queue you’ll be missing out on some of the great details that Disney’s Imagineers are famous for. 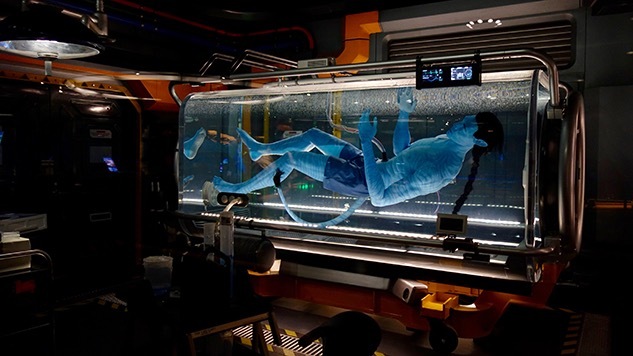 Na’vi River Journey may not match Flight of Passage in technical advances, but this family-friendly boat ride is rich in detail, showcasing the bioluminescent plant life found all across Pandora on a journey in search of the Na’vi Shaman of Songs. Back in the Valley of Mo’ara, Pandora glows after the sun goes down, from the sidewalks to the bioluminescent plants. Even the animal sounds are more intense, leaving the sense that you don’t know what may be lurking around the corner. If all your exploring leaves you hungry, stop by the Satu’li Canteen. Themed as a former mess hall for the humans living on Pandora, it is a fast casual spot serving breakfast, lunch, and dinner. As with many of the park’s newer eateries, you won’t find any chicken nuggets or hot dogs on the menu. The cuisine at Satu’li Canteen is slightly more adventurous. The primary item on the menu is a Create-Your-Own Satu’li Bowl, offering options for the base, protein, and sauce. We recommend the wood-grilled chicken or sustainable fish (ours was salmon) with the black bean vinaigrette over a red and sweet potato hash. The canteen also offers steamed bao buns in two varieties, vegetable curry or cheeseburger, complete with ketchup, mustard and pickles. Don’t laugh, they’re pretty delicious. Finish your meal with a blueberry cream cheese mousse, which is nearly too pretty to eat. Satu’li Canteen is the first restaurant at Disney World to offer mobile ordering. Guests can save their order in the My Disney Experience app, and upon arrival to the restaurant press a button in the app that you’re there and ready to eat. No waiting in line? Sounds like Disney magic. A plethora of themed snacks are also available throughout the land. At Pongu Pongu, the local drink stand, enjoy a Night Blossom, a non-alcoholic slushie that is a mixture of limeade with apple and desert pear, topped with passion fruit boba balls. The stand also serves pongu lumpia, a sweet spring roll stuffed with cream cheese and chunks of pineapple. Of course, Disney executives are hoping you leave Pandora with more than a belly full of tree spores. While it’s definitely a bit of a splurge, for about $75 you can bring home an Avatar based on your own likeness. After scanning your facial features, you can choose your Avatar’s body type and a figure will be created in minutes. The lengths that Disney has gone to, from the details of merchandise offerings to the landscape of the park itself, are remarkable compared to anything the theme park giant has done before. Disney broke ground on Pandora in 2014, after three years of development with James Cameron’s Lightstorm Entertainment. The ensuing years have brought a good bit of handwringing from Disney parks diehards who were unsure if Avatar was the right fit for Disney’s well-established brand. Disney executives contend that the film and Animal Kingdom share the same core values with a focus on the intrinsic value of nature. Regardless of where you stand on that debate, if Pandora is an example of what Disney’s Imagineers can do in creating an otherworldly experience, Star Wars fans should be even more excited for those themed lands to open at Disney’s California and Florida theme parks in 2019. Valerie Marino is a journalist based in Durham, North Carolina.